Precambrian volcanics associated with the taum Sauk Caldera, St. Francois Mountains, Missouri, U.S.A.
Petrological studies of 12 volcanic rock units in the northeast segment of the Taum Sauk Caldera, the major structural feature in the western part of the St. Francois Mountains, indicate that they were probably derived from the same magma chamber. These calc-alkalic rocks become progressively silica and alkali rich and calcium poor from the base to the top of the stratigraphic column. In the part of the northeast segment of the caldera studied in detail, the extrusives are over 5 thick and have a volume of over 500 km3. Rock units consisting of ash-flow tuffs, bedded airfall tuffs and lava flows were apparently deposited within a single episode of volcanic activity, since no signs of extensive erosion were observed among them. Although the rocks are completely devitrified, the preservation of pyroclastic and flow features is excellent. These volcanics are exposed representatives of a 1.3–1.4 b.y. old belt of volcanics and associated plutons which extends from southern Ohio to the Texas Panhandle any may represent a belt of continental accretion. 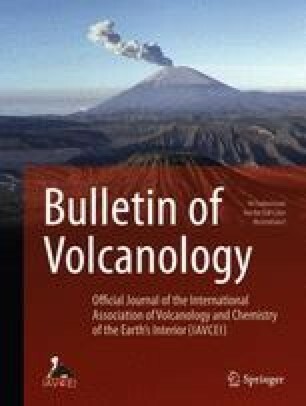 Paper presented to the Symposium on « Acid Volcanism », 15th IUGG Gen. Assembly, Moscow, Aug. 1971.